The Doorway Singers was founded in 1990, when four singers and an accompanist put together a medieval banquet in Hampton, Virginia. Shortly after their first performance they were hired to present a Dickens-themed Christmas program at the venue on the weekends. Thus, the first two programs, "The Courte of Sir Richard of Chichester" and "A Dickens Kind of Christmas," were born. Since then the Professional Acapella Group has expanded to its current size of 18 members who perform in quartets for festivals, corporate and private events, reunions, weddings, and several other venues. The Doorway Singers have performed at every major festival in the Hampton Roads area, including Harborfest, the Virginia Beach Neptune Festival, the Portsmouth Seawall Festival, and the Newport News Fall Festival. 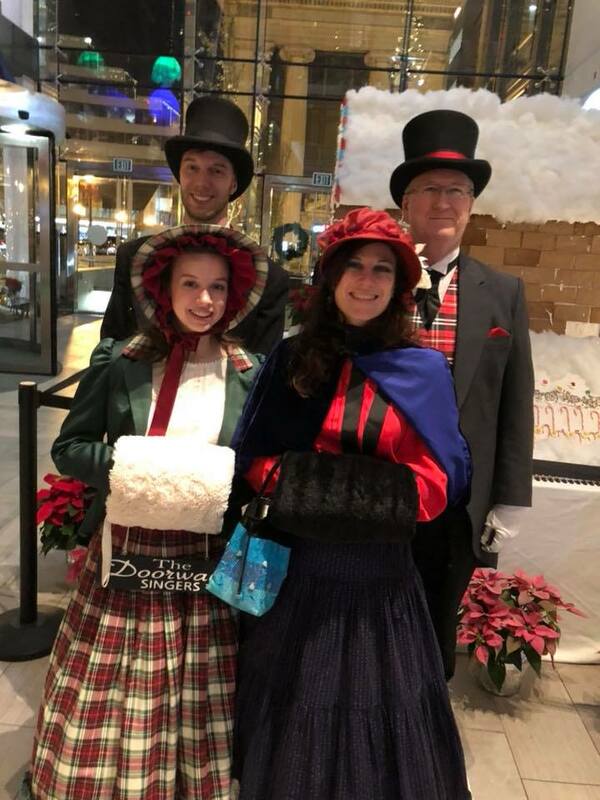 They were proud to be part of the national Christmas Tree lighting in Washington, DC, and the Opsail 2000 event in Norfolk. They have also been featured on Beach Street USA at the Virginia Beach oceanfront since it debuted almost 20 years ago. With a large wave of new members over the past few years, The Doorway Singers will remain a timeless piece of Hampton Roads history! The Doorway Singers is a group of musicians from the Hampton Roads area who collaborate with businesses, agents and entertainment venues all over the state. Doorway seeks to provide quality entertainment for its audiences and has done so for over 25 years. We are always seeking to try new outlets and venues. We have 7 current programs, listed on our homepage. Our Christmas program is the largest set and consists of 50 a capella songs. The other sets consist of a few a capella numbers, but generally are accompanied by back-up tracks and incorporate choreography. I see quite a few singers listed here. How many come on a gig, and can I pick them? Although we rehearse in a large group, we normally do shows in quartets, meaning that you will have four singers in your group when you hire us for a show. If you would like a larger or smaller number, note that on the gig sheet when you book us and we will work accordingly. Usually the schedule is created based on our singers' availability, so we cannot guarantee a specific singer. However, if you make a request we will do our best to accommodate. Gigs can be booked through our website, our Facebook page, or through our manager, Beverly. Occasionally we will work through a booking agent as well. What is a holding fee? As of 2018, your booking will come with a standard holding fee, which assures you the date and time that you have booked. You may choose not to pay the fee, but if another gig comes along on that date that will pay, you may have your booking bumped. This keeps our schedule from piling up with "possible" gigs so that we can provide great service for everyone. How do I become a Doorway Singer? Auditions are held once in the spring, once in the fall. These are on a case-by-case basis, since we do not need every part filled every year. Many times we will only hold an audition for a single part at a time. The auditions will be advertised on our website, Facebook, Instagram, and several other places, but feel free to message the Facebook page and ask at any time.